You see, I thought I could use a bit of prestidigitation (let’s call it magic) and conjure up a whole day’s ride to have the wind behind me all the way. Dishonourable, I know….and I deserve all the scorn that more compliant roadies might vent……but I may have been caught on the cameras of some road surveillance system watching out for cycling cheats like me. Well, I’ll just have to sit it out now and wait for a potential ‘slap on the wrist’ from a Dixon-of-Dock-Green type bobby who may call at the door at any time. D’you think I care……? 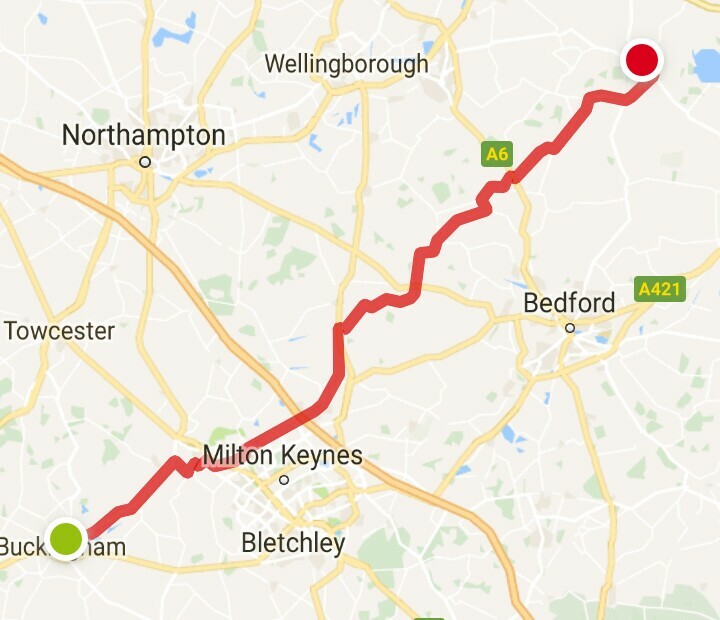 I took a 10km ride to a nearby town to climb on a bus, enjoyed a free 2 hour ride to Buckingham (the joys of the bus pass….😊) and then caught the wind in my sails and headed in a north easterly direction. I’d like to say it was plain sailing all the way, but it never is….. Yes, I chose my spot to have an instant puncture, when the air just exploded out of my tyre, and was completely flat before I could stop. Beside a noisy road, and with 30-40mph winds, it was well nigh impossible to locate the blow-out, and then I couldn’t find the cause. It’s always a bit nervy when you put a fresh tube in the tyre without knowing what caused the puncture, but I did…..but that wasn’t the end of the story. When I had finished inflating the new tube, as I tightened the valve, the pin broke….hey ho……but the tyre kept its pressure, so I continued my journey with all fingers and toes crossed. However, should I feel guilty about such brazen 🍒 picking? Would you? Posted on November 23, 2017, in Cycling UK and tagged adventure, cycling, travel. Bookmark the permalink. 12 Comments. …in the luggage hold (it’s a coach, really). No hesitation from the driver, but I suspect ordinary luggage would always take precedence. yes up here they are just ordinary buses so I take the dahon onboard. I go early though to avoid the peak times. We pay 30p before 9.30am but I know in other areas eg Northumberland its full fare. I got caught out on that one. I have also taken my camping trailer as well so that set up works well. ….yes, we too pay full fare before 9.30. But the bus I caught is technically inter-city (Cambridge to Oxford), but also serves as a local service for intervening stops. Oh, I’d do that in a second if we had ready transportation like that! That was me yesterday as I finished swimming in Kim high street off for 2nd breakfast! Ha! However, you can’t technically have a 2nd breakfast (break your fast twice)……perhaps a recovery snack then? 7 mile run to Kimbolton and an hour swimming – I need more than a recover snack! A full English in Olivers will do very nicely…. ¡Caramba! You deserved it then…. hope it had double of everything….